Volkswagen builds vehicles in Hamilton County. POLL: Are layoffs a bad sign for Volkswagen? Jason Hamilton, a contract worker at Volkswagen's Chattanooga plant for the past 20 months, said Thursday he had quit a higher-paying job so he could assemble cars at the factory. "I thought it was going to be a better opportunity," said Hamilton, who learned he is one of about 500 VW plant employees being laid off. The automaker told contract employees supplied by Aerotek that it is cutting 15 percent of the workforce. VW uses the staffing agency to screen, hire and provide temporary production jobs in the plant. VW executives blamed slower-than-expected growth in Passat sales and said they're doing away with a third production shift at the factory. "We had too high expectations," said Frank Fischer, who heads VW in Chattanooga. The layoffs are set to start at the end of May. Fischer said the Passat exceeded sales targets for eight to 12 months after the factory started assembly in 2011. A little more than a year ago, plant officials said they planned to add 800 employees to keep up with demand for the Passat. He said that projecting sales and production is "always like looking in a crystal ball." Still, he said, the company expects 2013 Passat sales to exceed last year's by about 5 percent. The company sold more than 117,000 Chattanooga-made Passats last year, and it set an all-time record for the vehicle in the U.S. The plant produced 150,000 cars in 2012. But, Fischer said, officials saw a trend of slowing growth in Passat sales late in 2012 and tried to avoid layoffs by reducing the number of production days. In the end, though, it wasn't enough. "We were very hesitant to lay off anyone," he said. But, "we have to adjust." Jesse Toprak, vice president of industry trends and insights for TrueCar.com, said the midsize Passat is in the most competitive car segment, vying against the Toyota Camry, Honda Accord, Hyundai Sonata, Ford Fusion and Chevrolet Malibu, among others. While the Passat sells well in metro areas and on the coasts, it needs to do better in the rest of the country, he said. "They need to break through that barrier," Toprak said. Aaron Bragman, Detroit bureau chief for Cars.com, said automakers use contract employees so they can adjust their workforces amid peaks and valleys in production. "It's a cyclical thing," he said. "Flexibility allows them to keep costs down." Aerotek workers earn less than typical VW employees. Fischer said the job cuts are unrelated to reports last month that VW officials in Europe are weighing the startup of negotiations with the United Auto Workers about a works council in Chattanooga. Also, the local VW CEO said, Chattanooga plant executives continue to battle for production of a full-size sport utility vehicle the automaker is considering building. If VW OKs assembling the new SUV, and if Chattanooga beats out a Mexico facility for production, that could lead to rehiring some of those laid off, Fischer said. He said the company is asking the laid-off workers if they want to be recalled later. After the job cuts, Aerotek will have about 100 employees at the plant and about 30 others will be offered status as VW workers, Fischer said. He said those losing their jobs are to be paid through June. However, Hamilton said he's worried more workers at the VW plant could be laid off. He said that he and about a dozen Aerotek workers already have applied for jobs with auto supplier Denso in Athens, Tenn., which is expanding. Hamilton said this is the second auto job from which he has been laid off. He earlier lost a job at a General Motors factory in Detroit. Hamilton County Mayor Jim Coppinger said he's hopeful VW eventually will bring back the employees. "We remain hopeful about VW," he said. Lacie Stone, a spokeswoman for Chattanooga Mayor Andy Berke, said in a statement that "Mayor Berke's thoughts go out to those affected by this situation. We are confident that Aerotek, through their strong partnership with VW, will continue to work with these employees as opportunities develop in the future." 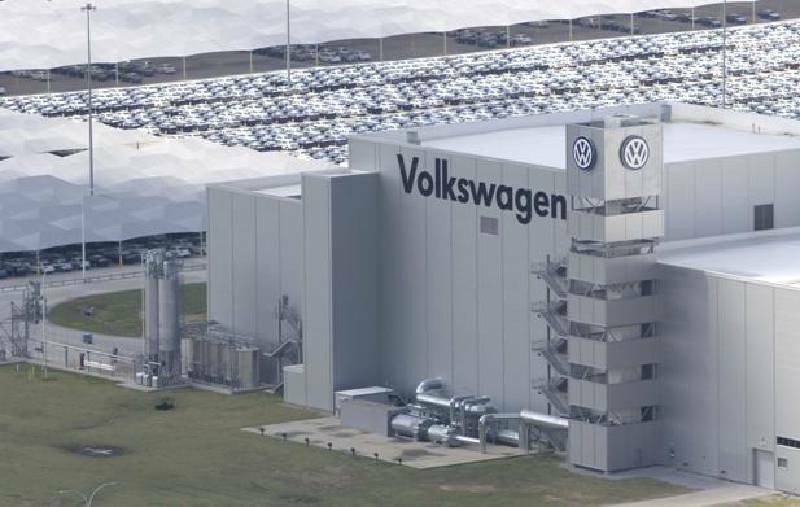 VW is the second major Chattanooga employer this year to unveil a round of significant job cuts. Citing a lack of orders for nuclear power components, Alstom's turbomachinery plant that opened here in 2010 announced it would trim its workforce by 80 employees. Contact staff writer Mike Pare at mpare@timesfreepress.com or 423-757-6318.